This, my friends, is a winner. I don’t know how many times I’ve made this dessert, but it never fails to be a show-stopper. I don’t know whether it’s the cake being served straight out of the oven, the warmth of the spices, or, hello, the over-the-top toffee sauce. It never fails to amaze people. Which is what is so interesting about these ingredients. 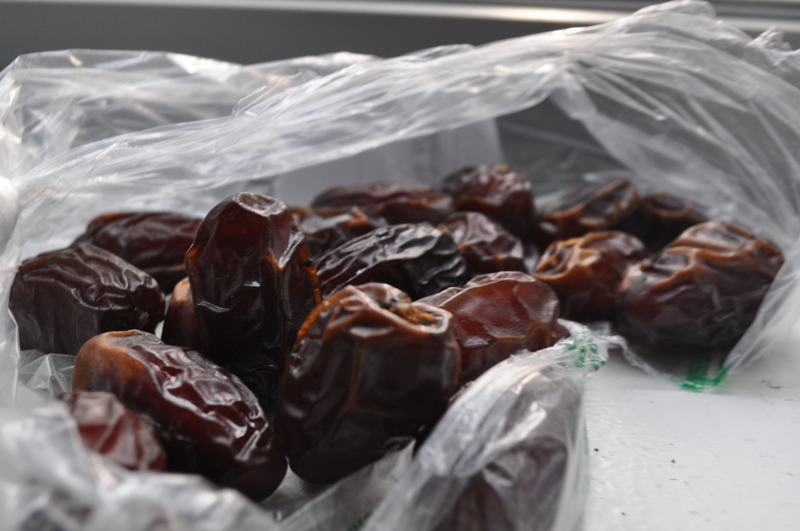 I love dates. They are little gems of wonder to me. But I never knew how polarizing they were until I made this cake. 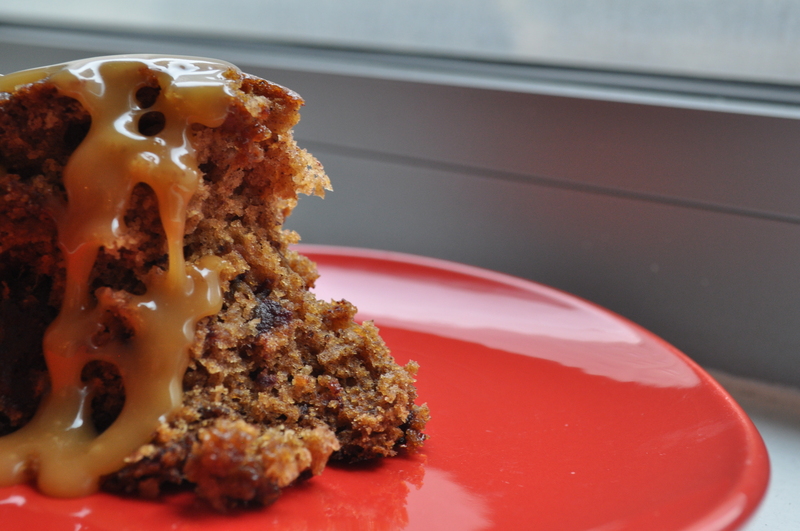 When people would ask me what was in the “pudding” part, I would excitedly tell them about the warm date cake. I got…well…reactions. It is quite astonishing how many ways people can contort their faces and say “dates? !” in a semi-disgusted manner. I don’t know what it is about this fruit. Maybe it’s the texture? Maybe it’s the sweetness? Maybe it’s people pretending to not like them because no one else does. I haven’t figured it out yet. 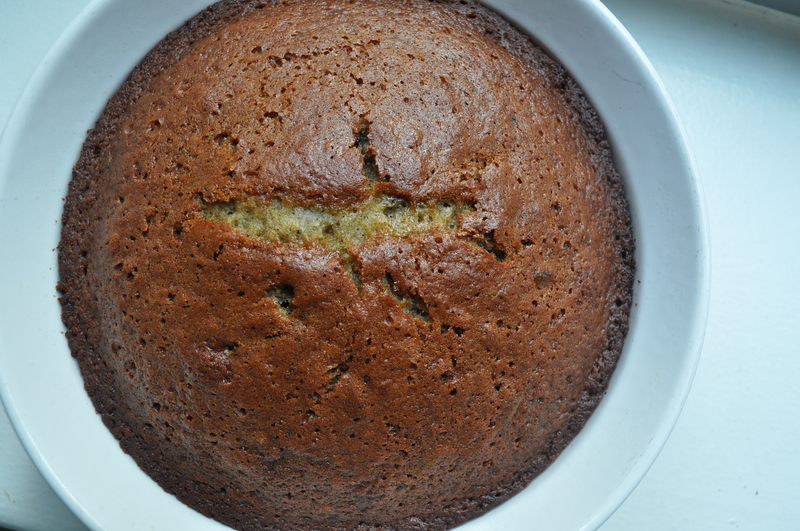 But put that aside, and you’re left with warm, moist cake with pockets of sweet dates and toffee, all served with a smoky, buttery sauce on top. Everyone went for seconds, even after finding out ingredient information. This is a star. 2. 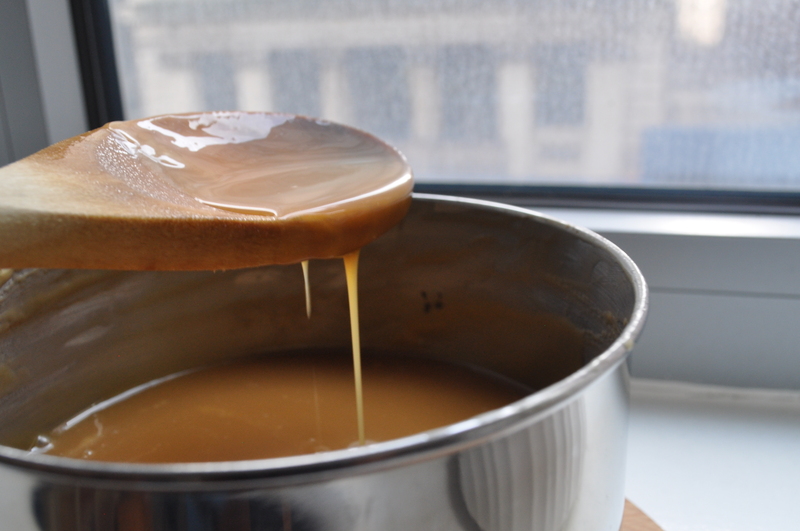 Make the toffee sauce by bringing the cream, demerara or turbinado sugar, golden syrup (or molasses/h0ney) and salt to a boil in a medium saucepan, stirring often to melt the sugar. 3. Lower heat and simmer, stirring constantly for about 35 minutes, until the mixture is thick and coats the spoon. Put it aside. 4. To make the pudding, in a medium saucepan, heat the dates and water. Once the water begins to boil, remove from heat and stir in the baking soda. 5. In a small bowl, sift together the flour, baking powder, and salt. 6. In the bowl of a standing electric mixer, or by hand, beat the butter and granulated sugar until light and fluffy. Gradually beat in the eggs, then the vanilla. 7. Stir in half of the flour mixture, then the date mixture, then add the remaining flour mixture until just mixed. Don’t overbeat the batter. 8. Scrape the batter into the soufflé dish and bake for 40-50 minutes, or until a toothpick inserted into the center comes out with moist crumbs attached. 9. Remove the pudding from the oven, and let cool and cover until closer to serving time. Poke the cake about fifteen times with a chopstick. Distribute half of the sauce over the top, as shown in the photo, cover with foil, then re-warm in a 300F (150C) oven, for 30 minutes. 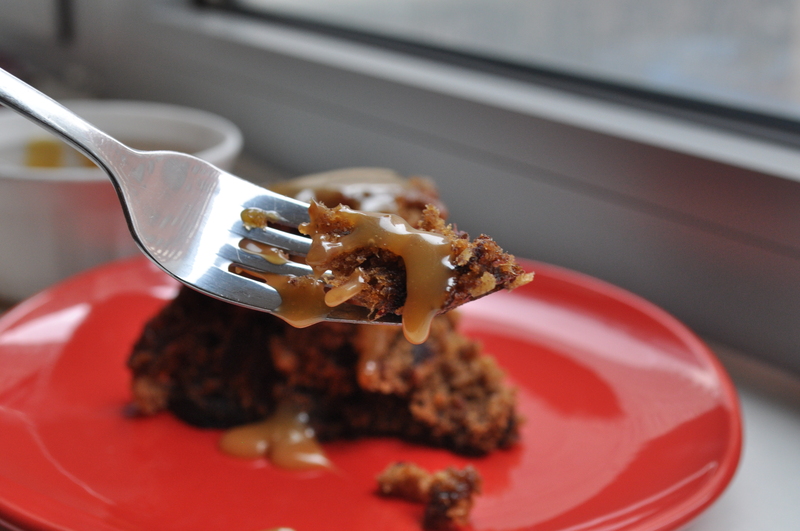 Serving: Spoon portions of the cake into serving bowls and douse with additional warm toffee sauce. This entry was posted on	December 18, 2014 at 1:22 pm	and is filed under Uncategorized.